Illustration of HIV and immune cells (macrophage, helper T-Cells, plasma cells). The above image is 500 pixels across, the original measures 4,000 pixels across. Human Immunodeficiency Virus (HIV or AIDS virus): HIV attacks a macrophage (top middle) and a Helper T Cell (lower left). New virus particles then bud from the macrophage. A B-lymphocyte (bottom right) gives rise to Plasma Cells (reddish cells on right) that produce antibodies (Y shaped molecules in red) that bind to HIV. 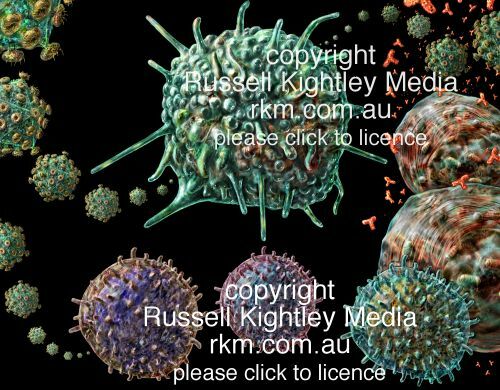 A killer cell (bottom middle) will attack virus infected cells. The interaction of HIV and the immune system is very complex and varies over time.